Oh Dog! I am so excited! Kong has some great new premium treats, and JAKKS Pets (manufacturer for Kong) sent me some to try out. Yum! Yum! Chicken Tenders, Pumpkin Stix, and Chews! 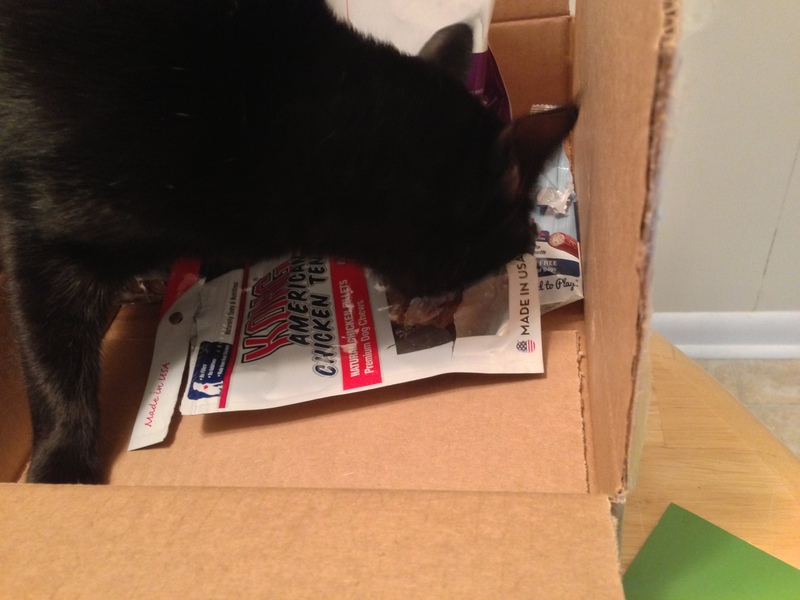 These premium treats are grain free and contain no animal by-products. The Pumpkin Stix are made with real pumpkin and include vitamins and minerals. Sadly, they also contain chicken, so they are not appropriate for dogs with poultry allergies. DeDe was disappointed to not be able to try them. The American Chicken Tenders are made in the USA with 100% chicken from the US. The Aussie Sticks (in the upper left corner) are made with real Australian beef or lamb. They’re great for keeping teeth clean. 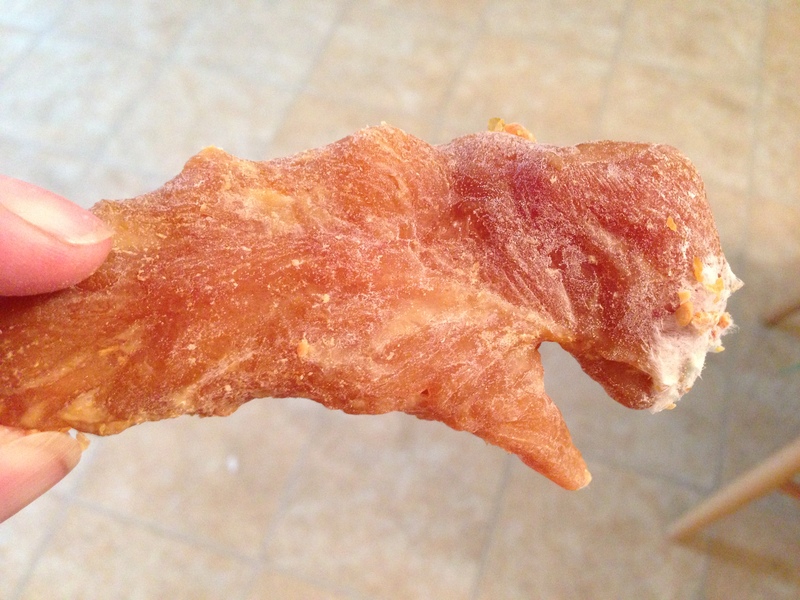 These treats are processed in Mexico. 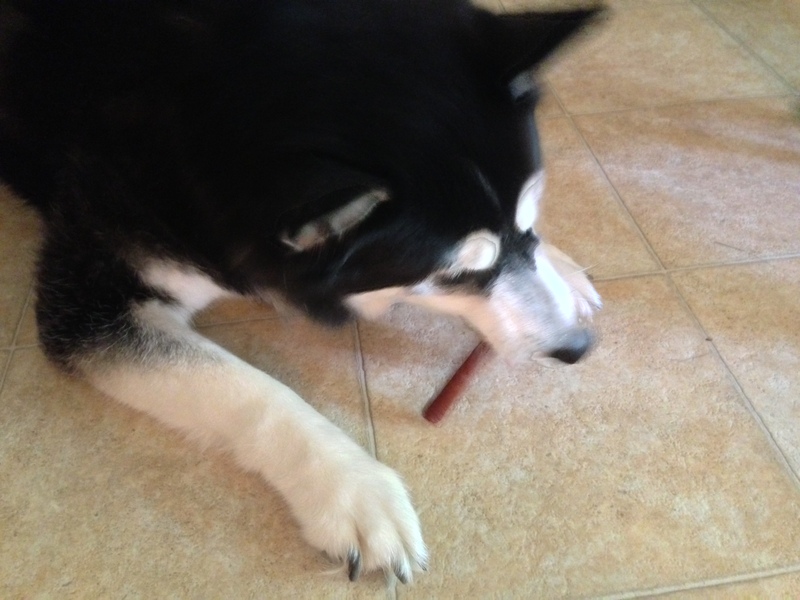 The Bacon Double Chews Rawhide Retriever Roll are made from US beef hide. They have a meaty flavor strip inside, and have no harmful preservatives. These treats are also processed in Mexico. If only you knew how lucky I was to get this shot. Were they a hit? Oh yeah. I was disappointed that DeDe wasn’t able to enjoy more of these treats. I did let her have a rawhide chew. My one gripe with companies that go grain-free is they usually don’t go the extra step and also leave out the poultry. Honestly, many dogs with grain allergies also have a poultry allergy. You may find this hard to believe, but Rumpy gets upset if DeDe doesn’t get something too, so I had to make sure she got a comparable treat. For manufacturers, that mean if I’m buying, I’m not going to buy your treats if both dogs can’t have one. Rumpy did enjoy every one of the treats provided. We also had a problem with the chicken tenders. Apparently, the cats wanted to try them too. Hey Graybie! Get outta my treats! Would YOU like to try these Kong Premium Treats? 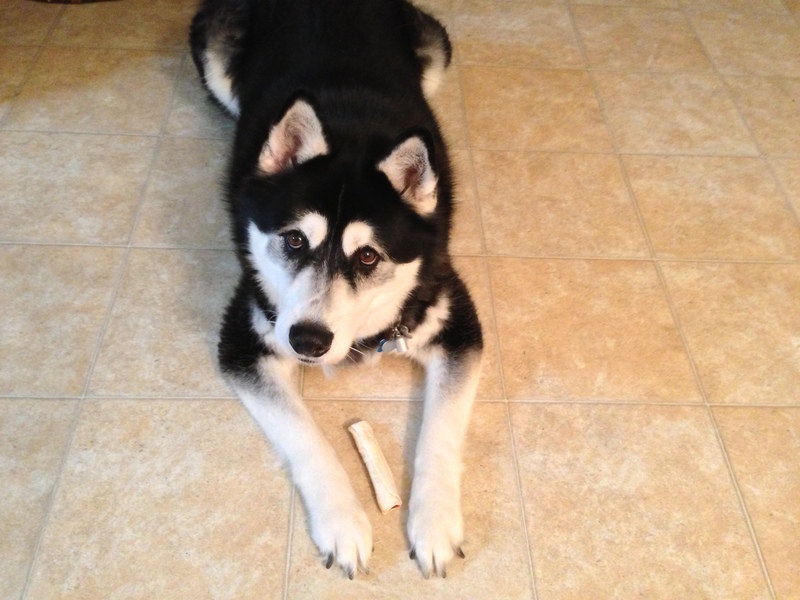 JAKKS Pets will give to three lucky US readers a prize pack with Kong premium treats. All YOU have to do is LIKE my NEW Facebook page or follow me on Twitter, and post a comment below that you do, along with your handle, and state that you’d like to be in the drawing. You have until midnight Thursday, September 19, 2013 (central daylight time), to get your entry in. I’ll randomly choose three lucky winners and contact by email, so make sure the email address you use to post your blog comment is valid. Disclosure: I was not compensated for this review. I did receive the treats at no cost to try. My thoughts on the product are my own. One of mine has a grain allergy too. I bet she’d love these though! Please enter me into the drawing? Thanks! Happy Monday Rumpy! Love to be in the drawing so my dogs can try the treats, Rumpy. Follow and “liked” page already. I have already like your page! I would like to have the prize pack so my dog friend Katie could try them. She is a very nice dog and would really appreciate delicious things to chew on. Mollie, Cassie and Maggie would all love to try the new treats! p.s. Aren’t we Mals so caring? I would be upset if Nalle didn’t get a treat tooowooowooooo! Ahh Rumpy! You were so lucky to get those! My Titan loves Kong treats but if we win, and PLEASE enter us, I will take these to the shelter with me so those poor babies can get spoiled a little bit! I’ve been following on both for quite some time now, @PibblesNMe . Thanks for the opportunity! My mother-on-law’s elderly beagle (adopted and a bit stuff in the leg but the sweetest girl ever!) can not have any grain in her food for reasons not entirely explained to me. She would love these treats and she deserves them! I might however get her to share the chicken with the cats! We would love to be considered for this drawing our handle is @Rshep29 and I also liked your new facebook page, my blog is http://mykidhaspaws.org/. Thanks! Today was a good day huh Rumpy. 😀 Aren’t package surprises the best? Especially if you don’t know what’s going to be in them. I am already following you on twitter, and if they had treats for kats I’d love be entered in the drawing! But I’m so happy for you! You are a lucky dog! DA treetz look yummy fer shure Rumpy n it iz so sweet of ya to want DeDe to have a treet when ya haz one!!! Ya are a guud poochie fer dat!!! BJ is so finicky I’m afraid he won’t like anything. Let it go to a dog who will like them. I love reading about what others think about new treats! Excited to try them. I would love to be entered into your giveaway. I follow you on twitter (@DrTrogstadPets)! liked your page on FB! I think my doggie would love to ttry this! 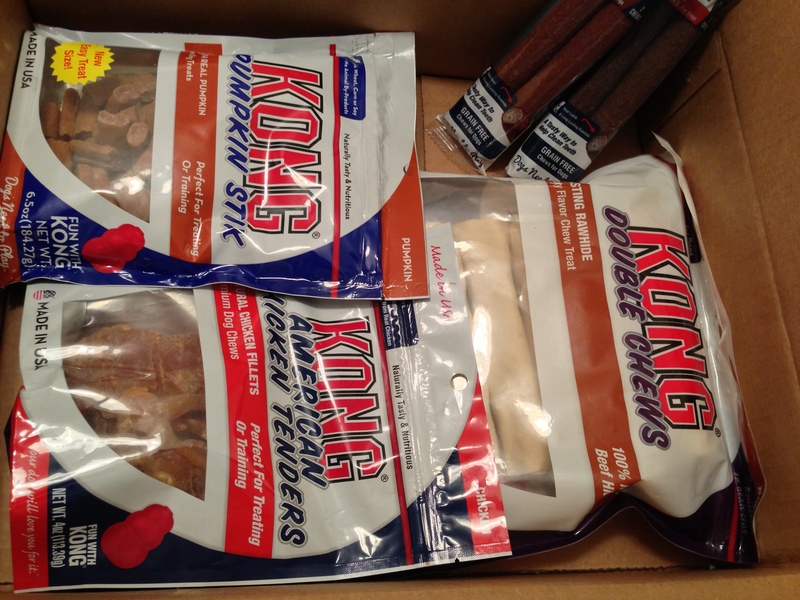 Please enter me in Kong treat giveaway! The menagerie lives in TX! They would love Kong treats!! Follow you on Twitter – @susitravl and I would like be entered in the giveaway.